Two of the biggest problems people are having with Cydia tweaks right now are them not working whatsoever or not showing their preferences in the Settings app. Both of these issues are caused by an incompatibility with Mobile Substrate and PreferenceLoader running on iOS 7. You can actually fix the issue manually by reinstalling both MobileSubstrate and PreferenceLoader after you install a tweak, but you will have to repeat this process for every tweak you install and this can become tedious. There is actually a solution to Cydia tweaks not working on Jailbroken devices running iOS 7 though and it’s called BootStrap. In non-technical terms the BootStrap Cydia tweak makes MobileSubstrate and PreferenceLoader play nice together. With it installed you should never run into an issue of a Cydia tweak labeled as compatible with iOS 7 not working on your device. The only exception to this being 64-bit devices with an A7 chip like the iPhone 5s. Here’s why. So how do you install BootStrap? Launch Cydia, tap on the Manage tab, go into the Sources Section, tap the Edit button and then the Add button. Tap the Add Source button and wait for it to appear in your sources section. 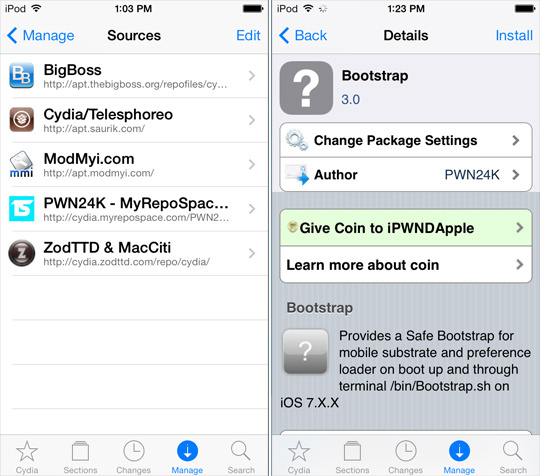 Go into the PWN24K repo, tap on the BootStrap package and install it to your device. Now install iOS 7 compatible Cydia tweaks and enjoy! With BootStrap installed you should no longer run into issues. This is IMPORTANT though so keep on reading. Once MobileSubstrate and PreferenceLoader are updated for support with iOS 7 you MUST REMOVE BootStrap before updating otherwise you will run into issues. With that said enjoy being able to install Cydia tweaks on your Jailbroken iOS 7 device. Was I supposed to get two new icons (TS Reboot and Respring) on my home screen after installing this? remove bootstrap before updating what? Yeah I’ve been getting this too!! bootstrap installs that respring icon.. hitting that respring icon sent me to the eternity of the apple screen … had to either let it die or pull the battery being that i am impatient i pulled the screen then the battery put it back together and it booted then rebooted then came back fine… worst part is itunes and i funbox did not register there was a issue. Once again…none of this works. Everyone’s best bet would be to hold off on “BootStrap” and all this for now and wait until Saurik updates MobileSubtrate in a day or two like he said. All the trouble would be gone! First reinstall mobile substrate, then reinstall preference loader. You have to be in developer mode to reinstall mobile substrate. you could’ve fixed that with ifile. happened to me too. Boot strap ain’t even popping up for me on the repo, I also tried the alternative repo it won’t even add the source. What to do? every while and then the app GAME OF WAR opens from cydia by itself without even touching the screen , is anyone facing this prob or knows how to fix it ? I did as you suggested and still I am not able to run most apps,some but not all.I understand about the 64 bit chip. Given that would you keep the app boot strap install. YES! Being in Developer settings finally (after hours of troubleshooting) did the trick! Doesn’t work for me. I searched all my package and I don’t have PreferenceLoader so Impossible to reinstall. I searched for it in cydia and can’t download it from any repo either…Is my jailbreak corrupted in any way? I jailbreaked and restore twice, redownload Evasion7 on every try, same thing. Am I missing something? This is happening to me as well :/ really bugging me. How do I get the pwn24k repo? okay i have tried install it ! but the prob remains the same ..
Go to var/stash/Applications and rename AdSheet.app to AdSheet.app.bak. Respring after that. Use iFile on your device to browse through your devices’s folders. Get StoreAlert from bigboss that fixes it. I used iCleaner and activated it, respringed my board and everything was back to normal so maybe you can try that as well, if this doesn’t work. my tweaks will not apper in setings app what do i do i have ios 7.1.1 and a iphone 5s.